Calcium is one of the main nutrients that the body requires in order to overcome the problems of the high blood pressure, heart attack, premenstrual syndrome and colon cancer. One of the main health benefits of calcium is that it helps in keeping the bones strong and healthy. If blood calcium carbonate levels are too low, the body will break down bone and teeth to increase the blood calcium carbonate levels. If the blood levels are high, then the body uses the extra calcium carbonate to rebuild bone and teeth. Alfacalcidol helps is regulation of the calcium balance in body. Calcium Carbonate is a mineral that is found naturally in foods. Calcium carbonate is necessary for many normal functions of the body, especially bone formation and maintenance. Calcium can also bind to other minerals (such as phosphate) and aids in their removal from the body. Calcium Carbonate is used to prevent and to treat calcium deficiency. Calcium helps to keep a check on the blood pressure and also it aids in muscle contrition, thereby enabling the heart and blood vessels to perform their functioning effectively. Alfacalcidol is an active metabolite of vitamin D, which performs important function in regulation of the calcium balance and bone metabolism. Alfacalcidol is vitamin D-hormone analog which is activated by enzyme 25-hydroxylase in the liver for systemic and in osteoblasts for local D-hormone action. It also possesses a unique pattern of the pleiotropic effects on gut, bone, parathyroid, muscle and brain. 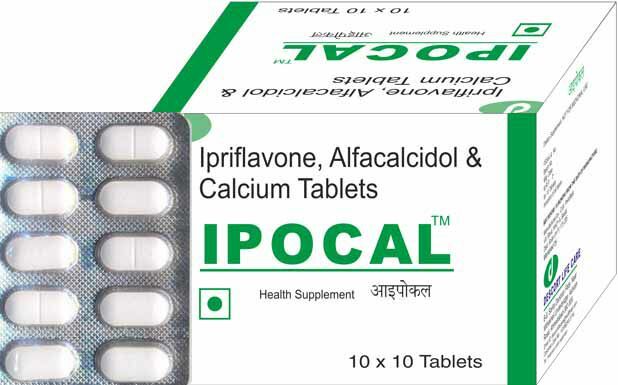 Ipriflavone is synthetic derivative of the isoflavone, acts primarily to suppress bone resorption and prevent osteoporosis in postmenopausal women. It is used as an alternative to hormone treatments for increasing bone mass and relieving the pain of osteoporosis. ● Used in the treatment of calcium-related health conditions like osteoporosis. ● It an effective treatment for dealing with stomach acid problems. ● Used to treat symptoms caused by too much stomach acid such as heartburn, upset stomach or indigestio. ● It is used in chronic kidney disease renal osteodystrophy. ● Helps in reducing thyroid hormone level in people with kidney failure. ● Reduce the risk of colorectal cancer. Osteoporosis is a decrease of bone mass. The small structures that form the bone matrix gradually become smaller and thinner, increasing the spaces between them. As a result, the bones become weaker, less dense and more porous. Calcium carbonate helps in increasing the bone mass by increasing the calcium, making bones strong. Calcium carbonate also works for indigestion or heartburn by directly neutralizing stomach acid. It works as a dietary supplement by supplying the body with calcium. Ipriflavone prevents bone density loss and help improve the effects of estrogen in preventing osteoporosis. Alfacalcidol is 1 alpha hydroxycholecalciferol; it is synthetic derivative of vitamin D3. It is a prodrug that is rapidly hydroxylated in the liver to active Calcitriol. Gastric Peptic disease occurs as a result of an unbalance between protective factors, such as mucus, bicarbonate and prostaglandin secretion and aggressive factors such as hydrochloric acid, pepsin and H.pylori. ● Calcium products bind to quinolones and tetracycline antibiotics in the intestine and can prevents their absorption into the body. ● Calcium carbonate containing products reduce acidity in the stomach. The reduction of acid decreases the absorption of iron from the intestine. Therefore, doses of calcium and iron should be separated by several hours.